© 2016 Robert Jeenchen Chen, Cheng-Chung Fang, Fuh-Yuan Shih, Chwan-Chuen King. Identification of high-risk severe cases from influenza-like illness (ILI) is crucial for disease surveilance and clinical management. Comorbidity and demography profile may be a good risk estimation. 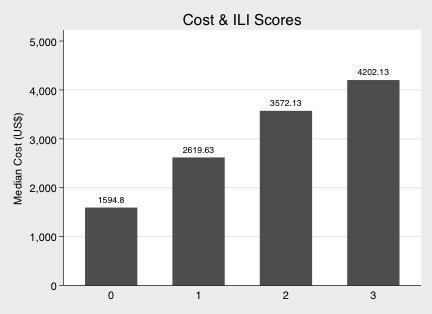 The study utilized Taiwanese National Health Insurance Database, ICD-9, and Marsden-Haug’s ILI Codes to measure the effect of systemic classes of comorbidity on four outcomes: ospitalization cost, length of stay (LOS), death, and intensive care unit (ICU) entry. From 2008 to 2010, there were 319,775 ILI inpatient cases, of which 8.82% entered ICU and 3.83% died at hospital discharge. The significant comorbidity attributes varied in each age stratum: heart failure in any age, non-dialyzed renal insufficiency in any age, cancer in school-age children up to mid-age adults, tuberculosis in the elderly, stroke in adults, congenital anomaly in children and adolescents, transplant in school-age up to adolescents, or HIV in young adults. Comorbidity vector was (heart failure, non-dialyzed renal insufficiency, cancer, tuberculosis, stroke, congenital anomaly, transplant, HIV). Age vector was (1, 1, 6<=age<45, 75<=age, 18<=age<65, 0<age<=18, 6<=age<18, 18<=age<45). Comorbidity score, the dot product of comorbidity vector and age vector, showed significant correlation with hospitalization cost (Spearman rho=0.1885, p<0.0001), and with LOS (Spearman rho=0.1717, p<0.0001). Its ROC area-under-curves (AUC) were 0.7454 with death and 0.6840 with ICU. The risk estimation model could facilitate us to address population measures for upcoming severe influenza epidemics, and further allocate resources optimally. Influenza-like illness (ILI) is often the initial presentation of influenza for practicing clinicians. With limited healthcare resources and medical attention, it becomes paramount to identify high-risk ILI cases by their comorbidity attributes for appropriate case management. Clinical Management Poster Session (Suppl. materials 1, 4). Retrieved from the one-million-per-year systematic samples of Taiwanese National Health Insurance Databases from 2008 to 2010, our cohort composed of all inpatient encounters (admissions) with the diagnostic ICD-9 (International Classification of Diseases, Ninth Revision) that matched the ILI definition proposed by Marsden-Haug’s Code-based Syndromic Surveillance (Marsden-Haug et al. 2007) in the defined scenarios. The defined scenarios were: within the same hospitalization, or with a prior ambulatory visit (outpatient clinic or emergency room) one or two days earlier. Comorbidity attributes were defined by appropriate ICD-9 codes that included most chronic diseases in several categories: immune-related, pulmonary, metabolic, cardiovascular, and others. 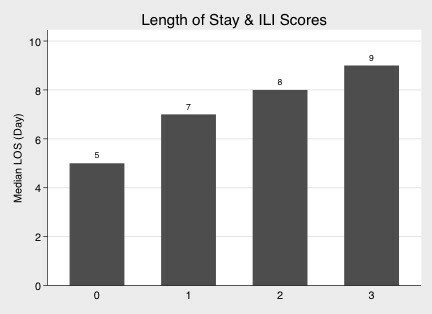 Four outcome measures represented severe ILI cases: hospitalization cost, length of stay (LOS), death, and intensive care unit (ICU) entry. Data management was done with SAS 9.3/SQL (http://www.sas.com) (sample codes Suppl. material 2) and statistical analysis was performed with StataMP 13 (http://www.stata.com) (sample codes Suppl. material 3). Univariate and multivariate analyses were done with the dependent variables as worse outcome, and the comorbidity attributes as covariates with the adjustment for gender in pre-defined age strata. The selected comorbidity attributes formulated Comorbidity vector and the corresponding age strata formulated Age vector. Comorbidity score was defined as the dot product of Comorbidity vector and Age vector. Its performance was assessed by Spearman correlation and by receiver operating characteristic (ROC) curves. One of the processed datasets for Stata 14 is published with the present paper as an example (Suppl. material 5). 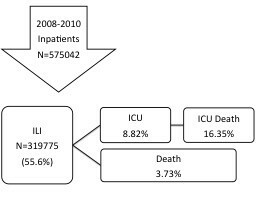 From 2009 to 2010, our cohort had 319,775 ILI inpatient cases, of which 8.82% entered ICU and 3.83% died at hospital discharge (Fig. 1). The significant outcomes-affecting comorbidity attributes varied in each age stratum: congenital anomaly and heart failure in the age from 0 to 5 years; congenital anomaly, cancer, heart failure, non-dialyzed renal insufficiency, and transplant in the age from 6 to 17 years; cancer, diabetes, heart failure, stroke, chronic obstructive pulmonary disease (COPD), liver cirrhosis, non-dialyzed renal insufficiency, and human immunodeficiency virus (HIV) in the age from 18 to 44 years; heart failure, stroke, and non-dialyzed renal insufficiency in the age from 45 to 64 years; heart failure, COPD, and non-dialyzed renal insufficiency in the age from 65 to 74 years; tuberculosis, heart failure, and non-dialyzed renal insufficiency in the age from 75 years and above. ILI case proportion and outcome distributions. Comorbidity vector was (heart failure, non-dialyzed renal insufficiency, cancer, tuberculosis, stroke, congenital anomaly, transplant, HIV). Age vector was (1, 1, 6<=age<45, 75<=age, 18<=age<65, 0<age<=18, 6<=age<18, 18<=age<45) (Fig. 2). Comorbidity score, the dot product of comorbidity vector and age vector, showed significant correlation with hospitalization cost (Spearman rho=0.1885, p<0.0001) (Fig. 3), and with LOS (Spearman rho=0.1717, p<0.0001) (Fig. 4). Its ROC area-under-curves (AUC) were 0.7454 with death (Fig. 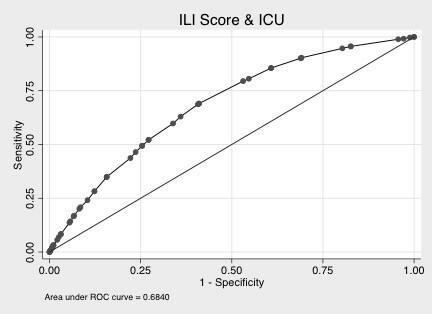 5) and 0.6840 with ICU entry (Fig. 6). Higher clinical alertness should be set once an ILI case matches the following age-specific comorbidity attributes: heart failure in any age, non-dialyzed renal insufficiency in any age, cancer in school-age children up to mid-age adults, tuberculosis in the elderly, stroke in adults, congenital anomaly in children and adolescents, transplant in school-age up to adolescents, or HIV in young adults. With the ILI severity score calculated, the score-plus-1 effects were significant on all outcomes of the study (Table 1). 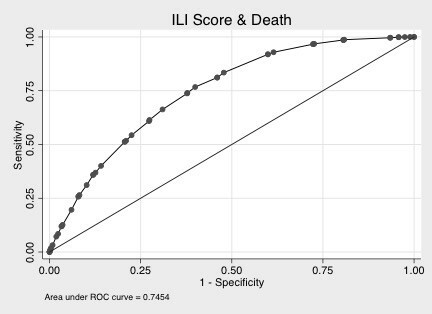 The ratios or odds ratios of cost, LOS, death, and ICU entry approximated around 1 to 2, showing the trends of worse outcomes with higher ILI severity scores. The risk estimation model could facilitate us to address population measures for upcoming severe influenza epidemics, and further allocate resources optimally for prevention and control in public health decision-making. Options for the Control of Influenza VIII, Cape Town, South Africa, 5-9 September 2013. See original poster (Suppl. material 4). Special thanks for Ms. Wen-Wen Wang for her administrative supports. Taiwanese National Health Insurance Database Research. Chen RJC: study design, manuscript writing, data management, and statistical analysis; Fang CC: concept proposal and research advice; Shih FY: study design and research advice; King CC: study design and supervision. A sample SAS SQL program code fragment is attached. The more complete version is available upon request. A sample Stata program code fragment is attached. The poster presented in the Conference. The dataset used for in Stata 14 format. The other datasets are available upon request.